Much of our lives involves a this-or-that decision. With each yes to one thing, we say no to another. I was thinking about this as I recently tweeted with What-to-Watch TV Master Tiffany A. White about where am in the Buffy the Vampire Slayer series (season 5 of Buffy, season 2 of Angel. Please do not tell me what happens!) 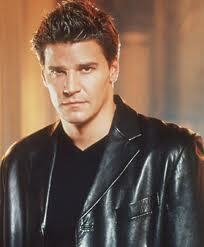 I’m sure the ending I would like to see isn’t going to happen, but I am still holding out for Team Angel. That’s how we talk about it these days, right? The Twilight fights of Team Edward vs. Team Jacob, this American Idol contestant or that one, this presidential candidate or that one (Bayard/Lamb 2012, by the way), and so on. However, my decision for the coming week is which of two novel ideas I should leap into and write. I have two plots and sets of characters that have been tugging at me like a protective vampire and a bullish werewolf. Which one to choose? As a matter of fact, I had already written a chapter for each novel idea. Having let them air out for a while, I sat down on Friday to take a fresh look. 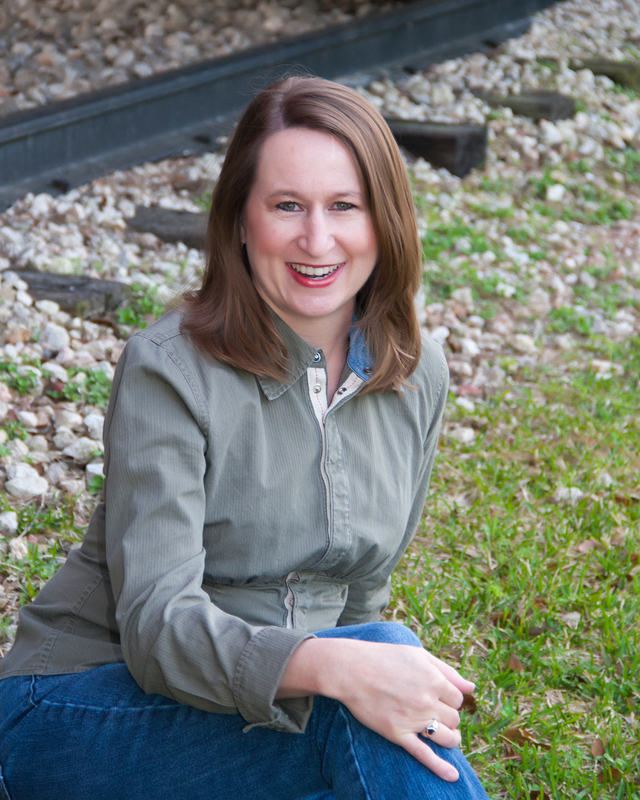 The young adult novel is much further along in story structure. I know where this novel needs to go — what the protagonist’s goal and obstacles are, how to incorporate the characters’ quirks, what the conflict of the scenes should entail, and how the climax will unfold. The other plot idea is mushier — more promising in some ways, but less solid. As much as I like it and want to get crackin’, that plot needs more time to simmer. So I’m going for Team YA. With that decision made, here’s a look at my ROW80 progress for the week. Finish editing Grace & Fire mystery novel and send to reader. Edits done and in reader’s hands. Write 2,500 words per week on work in progress. Most importantly, I MUST decide which work in progress to tackle. I have two novels plotted and can’t choose which one to focus on. Both stories are tugging at my hem and begging for attention. I have decided to write the young adult novel; its working title is Sharing Hunter. Blog twice a week on Amaze-ing Words Wednesday and Deep-Fried Friday, and check-in with ROW80 updates twice a week. Finito. Comment on at least 10 blogs per week. Done. Commented on 14 blog posts. This does not include any ROW80 updates or replies to commenters on my own blog. Read one writing craft book. Still reading another nonfiction book before I jump into On Writing by Stephen King. Read five fiction books. 3 down, 2 to go. Exercise three times per week. 2 out of 3 ain’t bad? How are you doing with your goals? Have you had to make any this-or-that decisions lately? Slogans: Do They Get You Elected? This week we are focusing on Election 2012! Today’s Amaze-ing Words Wednesday topic is campaign slogans, and for Deep-Fried Friday I will be interviewing Piper Bayard and Kristen Lamb, presidential and vice-presidential candidates with a marvelous slogan and governing ideas you’ll want to hear. So how about it? Do campaign slogans really matter? How powerful are words in getting a candidate noticed, taken seriously, and catapulted into the spotlight? Do we care what the bumper stickers say? Does it make a difference when we cast our ballot? Tippecanoe and Tyler Too! – William Henry Harrison led the first modern-day campaign with slogans, songs, and a populist feel. Harrison was formerly a commanding general who led American forces in the defeat of Native American enemies at the Battle of Tippecanoe in 1811. His running mate was John Tyler. The slogan conveyed confidence in a commander and had rhyme and rhythm. 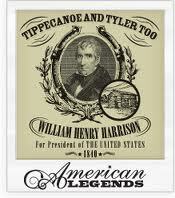 Ol’ “Tippecanoe” indeed won the office as the first Whig president in his campaign of 1840. However, President Harrison served only 32 days of his term. He died of a respiratory infection contracted while delivering his 1841 inaugural address in chilly weather without a hat or a coat. Give ‘Em Hell, Harry! 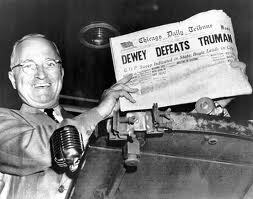 – This popular slogan was never the official one for Harry S Truman’s 1948 presidential campaign. He was elected Vice-President alongside President Franklin D. Roosevelt in 1944 but assumed the presidency when Roosevelt died in April 1945. The end of World War II only weeks later did not bring immediate peace and prosperity, but rather the difficult task of rebuilding after the war. It’s Morning Again in America – Ronald Reagan’s election to the presidency in 1980 was not due as much to effective slogans as Americans’ sense that incumbent Jimmy Carter had been an ineffective president. In 1984, however, the reelection campaign focused on reminding people that things had gotten better in the few years since President Reagan had taken office. Thus, the tag lines “It’s morning again in America” and “Leadership That’s Working.” Voters agreed with these encouraging sentiments and re-elected Reagan in a landslide with 49 of the 50 states. 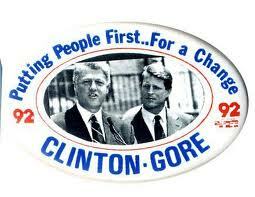 Putting People First – That was the official campaign slogan of Bill Clinton in 1992. However, the internal slogan which campaign manager James Carville posted in the headquarters was the one which caught on: “It’s the economy, stupid.” After a while of George Bush (Sr.) saying things weren’t so horrible, Clinton’s focus on the sluggish economy was refreshing for many Americans to hear. Along with Clinton’s assurance that “I feel your pain,” this slogan captured the attention of voters, and he defeated Bush to gain the presidential office. Change We Can Believe In – Perhaps you don’t remember that full slogan, but Barack Obama successfully used the word “change” again and again in the campaign. For a nation that had lost confidence in the current state of things, change was what they were looking for. 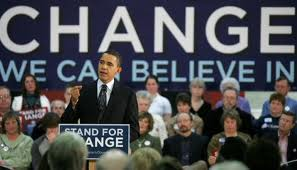 Obama also had campaign ads featuring his photo with either the word “Hope” or “Change” underneath. But these slogans don’t begin to compare to the more memorable chant that cropped up in the campaign and throughout candidate Obama’s appearances: “Yes, we can!” Barack Obama became our 44th president with a theme of change and a can-do attitude. For more campaign slogans, there is a good list at Tag Line Guru. What campaign slogans do you recall? Which ones have you liked? Do you believe these soundbites impact election results? What do you think would be an effective slogan for Election 2012? Be sure you come back here on Friday to see the terrific campaign slogan for Bayard-Lamb 2012. I will be interviewing them as part of their Election 2012 blog tour.